There is a national crisis that is being exposed within our elderly communities. For various reasons, nursing homes are understaffed and some are turning to the practice of overmedicating or over drugging. This practice not only violates people’s right to age with dignity, it also puts them in extreme danger. Nursing homes are purposefully misdiagnosing elderly people in order to prescribe medication that puts them in a docile state. This makes understaffed facilities function because there can be less staff per resident. Over drugging can be caused by pushes from pharmaceutical companies. How do I Hire You to be my Over Medication Injuries Lawyer? In an average week, nursing facilities in the United States administer antipsychotic drugs to over 179,000 people who do not have diagnoses for which the drugs are approved. The drugs are often given without free and informed consent, which requires a decision based on a discussion of the purpose, risks, benefits, and alternatives to the medical intervention as well as the absence of pressure or coercion in making the decision. The side effects of such drugs are the inability to talk, a sedative effect, and an inability to interact with others. When such drugs are given to patients without the appropriate diagnosis, resident risk of death increases, without their consent. This is wrong and extremely dangerous. Federal regulations require individuals to be fully informed about their treatment and provide the right to refuse treatment. Some state laws require informed consent prior to the administration of antipsychotic drugs to nursing home residents. Yet nursing facilities often fail to obtain consent or even to make any effort to do so. While all medical interventions should follow from informed consent, it is particularly egregious to administer a drug posing such severe risks and little chance of benefit without it. They describe this practice as “chemical restraint” and as described above it is illegal. It is the care facilities responsibility to act and operate with the well-being of its residents as a first priority. When they fail to do so, or choose to violate their rights, it should be recognized as abuse. It is extremely important to be aware of the risks of such a practice. Has your loved one fallen recently? Has their mood or behavior changed drastically in a short period of time? If so ask if there has been a change in their medication. These obligations are particularly important as people in nursing facilities are often at heightened risk of neglect and abuse. Many individuals in nursing facilities are physically frail, have cognitive disabilities, and are isolated from their communities. Often, they are unable or not permitted to leave the facility alone. Many depend entirely on the institution’s good faith and have no realistic avenues to help or safety when that good faith is violated. US authorities, in particular the Centers for Medicare & Medicaid Services (CMS) within the US Department of Health and Human Services, are failing in their duty to protect some of the nation’s most at-risk older people. 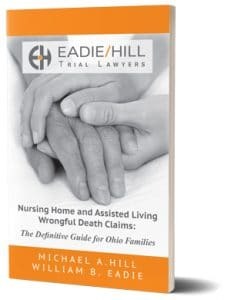 On paper, nursing home residents have strong legal protections of their rights, but in practice, enforcement is often lacking. Although the federal government has initiated programs to reduce nursing homes’ use of antipsychotic medications and the prevalence of antipsychotic drug use has decreased in recent years, the ongoing forced and medically inappropriate use of antipsychotic drugs continues to violate the rights of vast numbers of residents of nursing facilities. The US government should use its full authority to enforce longstanding laws, including by penalizing noncompliance to a degree sufficient to act as an effective deterrent, to end this practice. Failure to adequately enforce the right to be fully informed and to refuse treatment or to require free and informed consent requirement. The Nursing Home Reform Act of 1987 grants residents the right “to be fully informed in advance about care and treatment,” to participate in care planning, and to refuse treatment without penalty. If it were enforced fully, these protections would not differ substantially from the right to free and informed consent. However, without adequate enforcement, current practice falls far short of this protection. Lack of minimum staffing regulations. Adequate numbers of sufficiently competent staff are at the crux of nursing facility care. Yet government regulations do not set a minimum staffing requirement for nursing facilities, instead requiring that facilities determine for themselves what amounts to “sufficient” and “competent” staff for their residents. While experts put minimum adequate nursing staffing time at 4.1 to 4.8 hours per resident per day, most facilities self-reported to the government providing less than that; almost one thousand facilities self-reported providing less than three hours of staff time per day. Weak enforcement of federal regulations specifically banning chemical restraints and unnecessary drugs. Federal regulations prohibit chemical restraints—drugs used for the convenience of staff or to discipline residents without a medical purpose—and unnecessary drugs: a technical term meaning drugs used without adequate clinical indication, monitoring, or tapering. The regulations also provide for the right to refuse treatment. However, federal and state enforcement of these regulations is so weak that the drugs are routinely misused without significant penalty. Almost all antipsychotic drug-related deficiency citations in recent years have been determined to be at the level of causing “no actual harm,” curtailing the applicability and severity of financial sanctions. Nursing facilities must employ or obtain the services of a licensed pharmacist who: 1) provides service consultation on all aspects of the provision of pharmacy services in the facility; 2) establishes a record-keeping system that tracks the receipt and disposition of all controlled substances; and (3) determines that medication records are in order. At least once per month, a licensed pharmacist must perform a drug regimen review (DRR) for each resident. The pharmacist must report any irregularities to the attending physician or director of nursing. Furthermore, these reports must be acted upon. Nursing facilities must also ensure the proper labeling and storage of medications and biologicals. Medications must be labeled according to accepted standards of practice, and include instructions and expiration date when applicable. Medications must also be stored in a locked compartment and only authorized personnel have access to these compartments. This is significant because, at least once per month residents should be receiving a review of their medications that would include antipsychotic medications. It is important to ask the care facility, pharmacist, and physician whether or not this is occurring and to know which medications are being administered. Sometimes, it is not so easy though. There have been cases where elderly residents are being given these antipsychotic medications without their consent. In this case, it is important to know the warning signs below. Patricia Thomas, 79, went into a Ventura, Calif., nursing home with a broken pelvis, the only prescriptions she used were for blood pressure and cholesterol, and an inhaler for her pulmonary disease. By the time she was discharged 18 days later, she “wasn’t my mother anymore,” says Kathi Levine, 57, of Carpinteria, Calif. “She was withdrawn, slumped in a wheelchair with her head down, chewing on her hand, her speech garbled.” Within weeks, she was dead. Tragically, what happened to Patricia Thomas is not an isolated incident. According to Charlene Harrington, professor of nursing and sociology at the University of California, San Francisco, as many as 1 in 5 patients in the nation’s 15,500 nursing homes are given antipsychotic drugs that are not only unnecessary, but also extremely dangerous for older patients. The problem, experts say, stems from inadequate training and chronic understaffing, as well as an aggressive push by pharmaceutical companies to market their products. If someone you love is in a care facility and you notice that they are not acting like themselves, it is important to ask them how they are feeling. It is also important to question the care facility as to the change. Have they changed medications? What medications are they giving your loved one? And why? What are the purposes and diagnoses required of certain medicines? Do you have questions about a possible Over Medication Injuries case? Contact us now using this confidential form. We'll help you get answers. Most antipsychotic drugs have Black box Warnings – According to the FDA, a boxed warning is commonly referred to as a black box warning. It appears on a prescription drug label and is designed to call attention to serious or life-threatening risks. According to the FDA, unnecessary use of antipsychotic drugs kills 15,000 nursing home patients a year. According to Human Rights Watch, more than 179,000 people are given anti-psychotic drugs without the proper diagnosis. Has an elderly loved one been recently diagnosed with schizophrenia? This is a huge red flag because schizophrenia typically onsets in people in their early twenties. There has been a skyrocketing amount of elderly diagnosed with this disease because it allows nursing homes to meet the federal criteria for giving patients antipsychotic drugs. Know the difference between dementia and schizophrenia. Why was this diagnosis given? Who made this decision to diagnose me/him/her? What sorts of medication are you giving me/him/her? What are the risks of these drugs? Side effects? Who is going to be monitoring my/their symptoms? What is the plan to stop the antipsychotic? According to the chart below from 2014, twenty one percent of residents in long term care are receiving antipsychotic medications. antipsychotics should only be used as a last resort, and just for a month or so, before gradually being eliminated. Antipsychotic drugs change behaviors, Williams says. “They blunt behaviors. They can cause sedation. It increases their risk for falls.” And in the vast majority of cases, the drugs aren’t necessary. 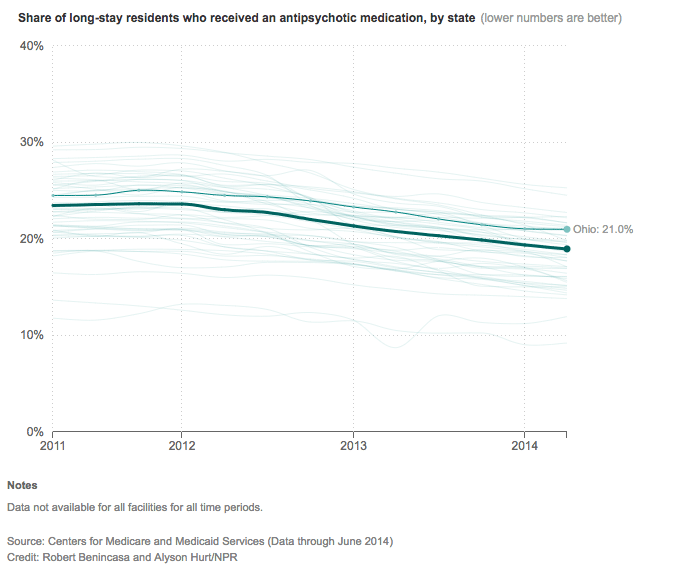 NPR also provides an interactive database to check to see the history of antipsychotic drug usage at nursing homes in your area, you can access it here. If you believe that yourself or a loved one has been victim of this horrific practice, please contact us. Nursing homes need to be held accountable for not providing proper care for people they are responsible for. It is extremely important to watch for signs of over drugging or over medicating as it could mean life and death. In February of 2018, Human Rights Watch released a report which outlines how nursing home patients with dementia in the United States are improperly given medicine that they do not need. This is a national issue that needs to be addressed. Elderly people are being unknowingly put into danger and abused by this practice. It is causing elderly people to suffer even become like zombies. According to an article released from WTHI-TV 10 in Terre Haute, Indiana, nursing home resident’s children and loved ones reported that their parents were turned into zombies because of what nursing home administrators have admitted doing. According to the article, they admitted to administering drugs without the appropriate diagnosis, informing the resident or loved ones of the risks, or securing informed consent. The article references the Human Rights Watch report as well as a CNN report, that reported on how drugs were being misused in nursing homes. Both reports highlight the dangers of overprescribing medication to nursing home residents. One of the largest issues in this matter is the fact that residents and their responsible parties are not being informed of the change in medication or the risks of taking such medications. According to the article, the Food and Drug Administration has not approved such practices as an effective way to treated dementia. An article in the Kansas City Star reports that government officials and advocates are speaking out against the horrific practice of nursing homes overmedicating residents. According to the article, Kansas has always ranked near the top percentage of medicated residents. This means that thousands of residents in nursing homes are being given drugs that are not necessary and actually puts them at risk of harm. Former Secretary of Aging, Kathy Greenlee, says that the practice of utilizing drugs or chemicals to restrain nursing home residents is the result of the removal of physical restraints in nursing homes and care facilities in the 1980s and 1990s. Now when people visit nursing homes they’ll no longer see residents strapped to beds and wheelchairs. But they will likely see some under “chemical restraint,” through the use of anti-psychotic medications like Haldol and Seroquel, which Charlene Wagner said have caused her husband to deteriorate.